Terry Pratchett is gone, and the world of fantasy is that much poorer this morning. I cannot claim to have known Terry well, but I ran into him at dozens of conventions over the decades, shared a stage with him a few times, and once or twice had the privilege of sharing a pint or a curry. He was always a delight. A bright, funny, insightful, warm, and kindly man, a man of infinite patience, a man who truly knew how to enjoy life... and books. He is survived by Granny Weatherwax, Nanny Ogg, Mort, Death, Death of Rats, Commander Vimes, the Librarian, Cohen the Barbarian, Rincewind the Wizard, the Luggage, and hundreds of other unforgettable characters, whose adventures will continue to delight and surprise readers all over the world for many years to come. Terry Pratchett was one of the good guys. He'll be missed. Someone needs to stop this whole 'dying' business already. It takes away too many good artists. "Death isn’t cruel, merely terribly, terribly good at his job." Cheers up ! He's now playing cards with Albert and the four horseperson of the Apocalypse in Death's mansion. Well, I guess. No, I hope. "It is not easy talking about death, harder still to talk about our impending own. But Sir Terry Pratchett did so with the same wry sense of humor and tenacity that he wrote with, bringing awareness to the disease that took him from us and us from him. He created innumerable and wonderful characters during the time he sat at his computer, but it is his character that we celebrate now—his courage, his strength, and his ready laugh. I’ve never hated reading “The End” so much as I do right now. Thank you, Sir Terry Pratchett. I've been so sad reading this news. I mean, I knew he was very sick, but he seemed always immortal in my mind, for some reason. He will be missed greatly. Somewhere, a giant turtle is crying, turning off a star. I think that is the best I have read. Wonderfully put! /\ Your Avatar = "Not today!" May Terry find safe harbour in the Summerlands with ALL his charaters there to geet him. I am confident Lady Sybil Deidre Olgivanna Vimes (née Ramkin), Duchess of Ankh would have welcomed Daenerys' dragons into the Sunshine Sanctuary should they have ever taken ill. It would be nice to see a Ramkin or Vimes appear near the Dragons in your next book in homage to the wonderful Pratchett. "For what can the harvest hope, but the care of the reaper man?" "No one is finally dead until the ripples they cause in the world die away, until the clock wound up winds down, until the wine she made has finished its ferment, until the crop they planted is harvested. The span of someone's life is only the core of their actual existence." There's a 400+ post Fark thread about him, and nary a negative thing to be found (which is a bloody miracle on that site). Thank you for expressing it that way. It was very right. "It is often said that before you die your life passes before your eyes. It is in fact true. It’s called living." It was not easy to understand Pratchett at first, you know, translation and that kind of humour ... but in the end, after many years, I can recall some of its novel as if I read them yesterday. He was a true master of fantasy. He will live forever for this. Alzheimer's has taken another great mind. It breaks my heart. I'm gonna read the Diskworld series again. RIP. Thank you for this. I grew up reading Sir Terry's books (as well as your own) and he is one of my very favorite authors. The Discworld characters have been my friends through the roughest of times and I am glad to have the books to keep me company even though the man himself is gone - and glad to be in such good company missing him. 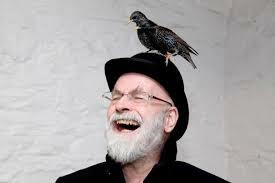 Terry Pratchett was a brilliant writer who's stories hold a special place in the heart of me and my sis. I am thankful for everything he has done, and wish he didn't have to suffer through Alzheimer's. Still, there is so much that he accomplished and some of his brilliance lives on in his books, and the world is still better because of him. I learned today that Sir Terry left us one for the road. His last book hit the editing phase before he died, so we should see 'The Shepherd's Crown' in September. They will be just as wonderful as the first time you read them. I reread them regularly, so I know. I've begun already.